The exact history of how the Ukrainian village rugs of the 19th century came to be is a subject of considerable debate. The mystery is, perhaps, part of their perennial appeal. In the 1800’s, when the vast majority of its antique rugs were woven, Ukraine was divided between two clashing empires: The Habsburg Empire in the west, and the Russian Empire in the east. They split Ukraine in two, and though the country maintained its centuries-old cultural identity, Russia, fearful of nationalist sentiment, placed strict limitations on expressions of native Ukrainian language and art. What the Russians feared was not entirely imagined: following nationalist uprisings of the late 18th century—most notably the revolutions in America and France—at no time in its long history had the Ukrainian sense of self, and of independence, been stronger. This tense period in Ukrainian history sets the stage for the brief, but prolific flourishing of the country’s weaving arts in the 19th century. The textiles seem to have emerged primarily from small villages scattered throughout the country, from pastoral towns in the foothills of the Carpathian Mountains, to farming villages in the vast steppes of the country’s interior. 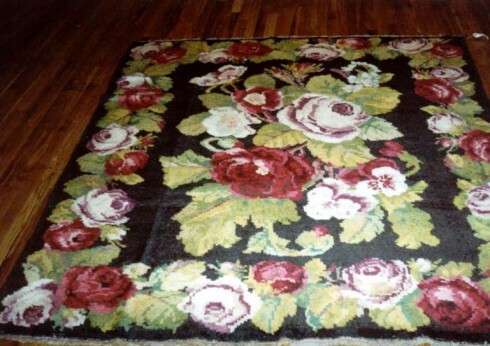 But few of the rugs can be pegged to any specific workshops or even any specific town. Significant, centralized capital and labor must have been used to create the largest, most detailed knotted-pile examples of the form, and yet only handfuls are known by name. There is little if any documentation, official or otherwise. So fraught was the relationship between art and politics, Ukrainian and Russian identity, perhaps the records were simply never kept. What we do know is the 19th century carpets that emerged from villages, and in some cases even cities, are uniquely Ukrainian in design and form. The complex designs derive from multiple sources, bearing no clear imprint of the specific place where they were made, yet still, there are shared qualities that make these rugs unique to the region and the time. The designs exhibit the direct influence of two primary sources. 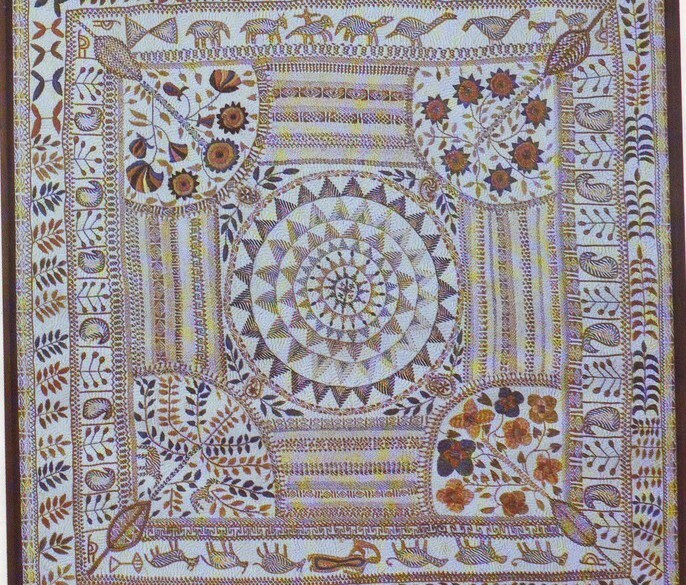 The first is local folk art. Ukraine has long possessed a thriving tradition of weaving and embroidery, practiced mainly by women, used to create everything from clothes to bedding to carpets. The second influence is international, and comes primarily from the French workshop carpets (such as the Savonnerie) of the 18th century. These palatial rugs were extremely fashionable among the Russian aristocracy, and certainly would have been known to the Ukrainian weavers. By combining what we might fairly call these diametrically opposed traditions—the dark, rustic, whimsical designs of Ukrainian village art; and the light, refined, elegant designs of the major French workshop carpets—they created a singular achievement of Ukrainian textile art. These are unmistakably village rugs at heart, but ones that gracefully synthesize their rural roots with the high influence of their cosmopolitan forebears. They bring a casual, informal charm to the baroque designs of late 19th century Europe. Most of the antique Ukrainian rugs that appear on the market today are Kilims—flat-weave, reversible carpets with exposed warp and weft. Others are knotted-pile carpets, and still others, most intriguingly, are combinations of the two forms: partially-piled carpets with Kilim structure and knotted-pile accents. They are particularly well-known for a brooding palette that distinguishes them from other carpets of the era. The Ukrainian rugs are full of dark conifer greens, deep reds, and sandy earth tones that mirror their dark, but beautiful, history.